The Ryerson Rams women’s basketball team couldn’t find their footing against the defending national champions Carleton Ravens losing 71-62 at the Ravens’ Nest on Jan. 26. On the night, the Rams struggled from the field, shooting just 35 per cent and 26.9 per cent from long distance against a Ravens team that ranks first in the OUA in opponents three-point percentage. 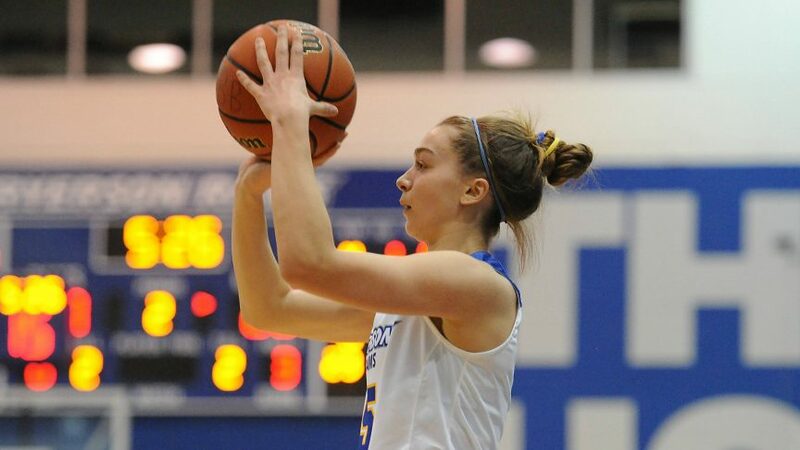 Ryerson guard Cara Tiemens had a team-high 13 points, four rebounds, and four steals but it wasn’t enough, as the Ravens won their fifth straight game and take the season-series sweep over the Rams. Ryerson also picked up their second straight loss and now currently hold a 14-4 record with five games left in the regular season. Led by guard Nicole Gilmore, the Ravens ran away with this contest in the fourth, extending their lead to as large 16 late. Gilmore dropped a career-high 29 points and 12 rebounds to lead the Ravens to the nine-point win. A slow start saw the Rams miss their first six shots to begin the game, but second-year guard Marin Scotten provided a spark, scoring six of her 11 points in the quarter to give the Rams a slight 13-12 lead. This was Scotten’s first start since Nov. 30 against Lakehead, missing the first five games to begin the second half of the season with an injury. In the second frame, it was all Ravens, who went on a 14-4 run for a seven-minute period in the quarter. Despite this, Ryerson managed to keep the game within striking distance, only trailing 28-25 at the half. Unfortunately, the Rams’ shooting slump would harm them the rest of the way, leading them to the eventual tough road loss. In their last meeting against Carleton on Jan. 5, Jama Bin-Edward scored 20 points on 44.4 per cent shooting. On Saturday night, Bin-Edward didn’t see much action due to foul trouble, playing just 16 minutes while recording five points on five shot attempts. With the loss, the Rams now sit third in the OUA East behind the Ravens and Ottawa Gee-Gees. Ryerson will be looking to get back to their winning ways, with four of their last five games in the regular season being against teams under .500. UP NEXT: The Rams will take on the Toronto Varsity Blues at the Goldring Centre on Feb. 1. Tip-off is scheduled for 6 p.m.